Home Event Eventful Events News PCG Typhoon Typhoon Nina At the height of Typhoon "NINA" MV Starlite Atlantic sinked. 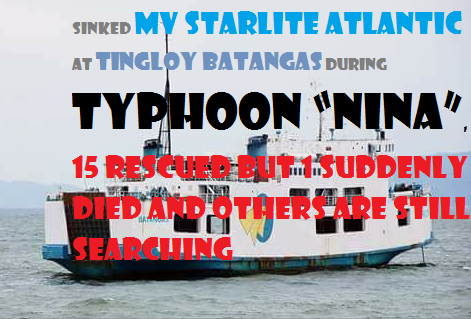 At the height of Typhoon "NINA" MV Starlite Atlantic sinked. Some crew members are still missing. While “NINA” is raging at the said vicinity which is between Maricaban and Mabini, Batangas, an MV Starlite Atlantic ship is experiencing a dangerous plight of a huge waves and powerful winds while running aground off Batangas coast. Based on the reports and PCG, there are 15 people, including the ship's captain, survived. But sadly, one exhausted female crew died. There are still some crew members missing. The search and rescue operation is going 24/7 for the remaining crews.